Specify a delivery date for your fresh petals. It is important that you have your petals delivered the day before your event to ensure freshness. The date must be a Tuesday, Thursday or Friday. Deliveries are not made on Saturday, Sunday or Monday. We need 4 business days to process your order for shipping. This means your earliest available delivery date is 4 business days from today. During the checkout process ignore the "Arrives By" date given next to your shipping cost. The date you enter in the space provided will indeed be your delivery date. If you have comments or special instructions for us please enter them in the space provided. Fresh rose petals are a perishable product but they are not as fragile as most people think. We take the utmost care in packaging only the freshest petals so you can expect the most beautiful product available. 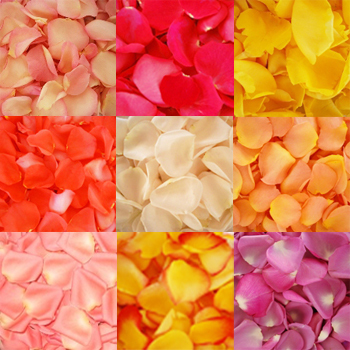 Our rose petals are best left in their original packaging until ready to use. We ship our rose petals to arrive when you need them - usually at least one to two days before your event. They will hold up well for several days in their packaging if kept in a cool environment. If possible, wrap plastic container in towel and place in refrigerator. With fresh rose petals you will want to a AVOID two things: (1) Moisture and (2) Freezing Temperatures. We recommend storing the fresh rose petals in a refrigerator. Keep your eye on them since every refrigerator differs in temperature and humidity. DO NOT put your rose petals in an area of the refrigerator prone to freezing. If the fresh rose petals look as if they are drying out, remove them from the refrigerator and store them in a cool spot out of sunlight and away from heat (such as in the garage or basement) in the box they came in. If your fresh petals arrive in less than perfect condition you must contact us within 24 hours of delivery so we can send a replacement or issue a refund. We are not able to issue a refund or replacement for a shipment that has not been signed for at delivery, has been left outside and damaged, and/or has not been stored properly after delivery. Please choose a delivery address where someone will be available to sign for the petals and bring them inside for proper storage. Our company is also not responsible for courier delays due to inclement weather conditions and delays as a result of terrorism, power outages or other natural acts.